The brick walls are there to give us a chance to show how badly we want something..."
-Randy Pausch, "The Last Lecture"
Some may see a piece of paper in a frame. A certificate. And they would be right. Thing #3 was named to her high school's "Music Hall of Fame" last week. It's a limited group. To be included, one must audition and achieve acceptance to the state level chorus during their high school career. Which means successfully navigating the gauntlet of auditions starting at the district level. Thing #3 did that. Not once, but twice. And then she went further...she was named to the All-East Chorus which performed in Rhode Island last month. Fantastic in it's own right. Even more so, if you could see the rest of the story. What do I see? I see perseverance. I see determination. And yes, I see a bit of validation. What most do not see is a girl who auditioned for her first high school musical and...was cut. Not even a miniscule part in the huge ensemble. Cut. Her entire social circle got to be involved in an activity that she yearned for. What did Thing #3 get? She got to come home from school every day, be alone, wonder why, and yes...shed a few tears. Oh, and she also got a few BRILLIANT lectures from moi, about "character building". They were usually quickly followed by me exiting the room and shedding a few tears of my own. The hardest part of being a mom is I can't stop the world from hurting my Things. What most do not see is a girl who eventually would become part of theater ensembles. And be grateful. Because she enjoyed singing and performing in whatever capacity she was allowed. She never turned down a role because it was too small. On the other hand, she never got to experience a role that was large enough to challenge her. But she never complained. Because she loves to sing. Perseverance. Steadfastness in doing something despite difficulty or delay in achieving success. With the help of a couple of teachers who believed in her, worked with her, pushed her, and yes....at times aggravated her...she found her voice. Literally and figuratively. 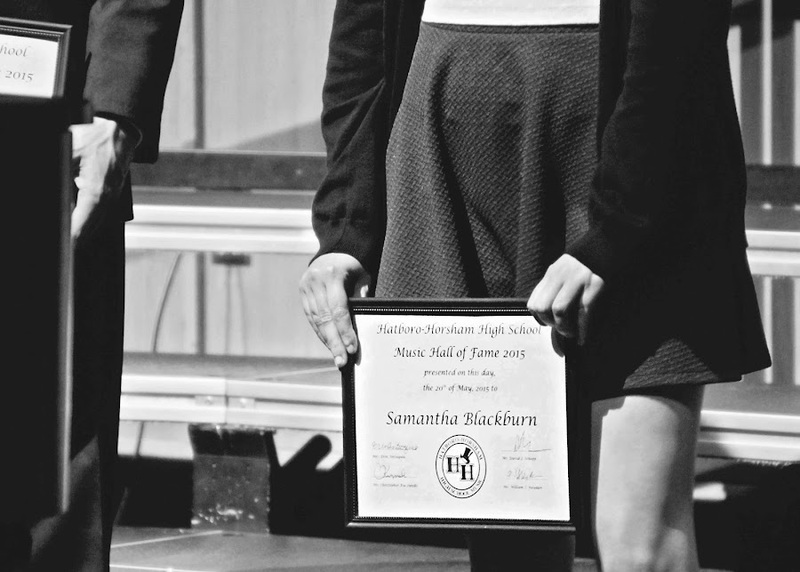 The only girl in the class of 2015 to be inducted into the "High School Music Hall of Fame". Facts are learned in the classroom. Lessons are learned in the day-to-day brick walls one encounters. Do they stop you? Do you persevere? Thing #3 gets her high school diploma in a couple of weeks. But in my mind, this simple piece of paper in a frame that she received last week, is where her real education took place. Most have the capacity to memorize facts and figures. Not everyone has the capacity to encounter a brick wall and bust through it. Perseverance. Yep...that's what I see. P.S. This post is part of the 5 days/5 photos/5 stories challenge I've decided to undertake. Well done! She ( and you!) can be really proud. Congratulations! She most certainly has learned and developed character that will server her well in all she endeavors moving forward in life. Yes. Yes to it all! To pushing through, breaking down walls and finding her voice! And yes to those mom tears... I watched a mama swan today keep the one day old babies safe underneath her - scooping them back every time they tried to venture away from her...And I know she can't keep them safe forever - just like us. Sigh. This is a story with a really good ending!! Congratulations Samantha! What an honor. Perseverance is a wonderful tool to have. Congrats! I know you're busting your buttons! Kudos to you both ~ So glad she persevered ~ HS always seems like the end of the world if don't meet 'group expectations' ~ it really is a 'drop in the bucket' ~ She will do well in life ~ she has 'what it takes' and a great Mom! Wonderful BW shot! well done and congratulations to her!!! I received a drama award in high school, and to me that was even sweeter than my diploma too. because I was so shy and anxiety filled when I first came to a new high school --- to grow into a person who could be on stage in front of hundreds of people was quite a success for me. enjoy it and keep persevering! Way to go Thing 3!! Congrats to Thing 3 and Things supportive parents.